Are you sure that’s my baby? 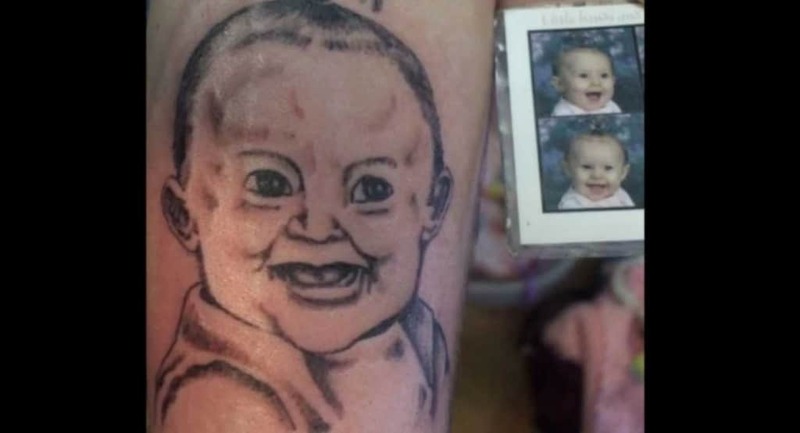 Everyone loves their babies, so getting a tattoo of them isn’t uncommon. You would, however, expect the finished product to actually resemble your offspring, rather than looking like Baby Sinclair from The Dinosaurs. I imagine this kid may have a complex if he grows up and thinks this is what he looked like as an infant. 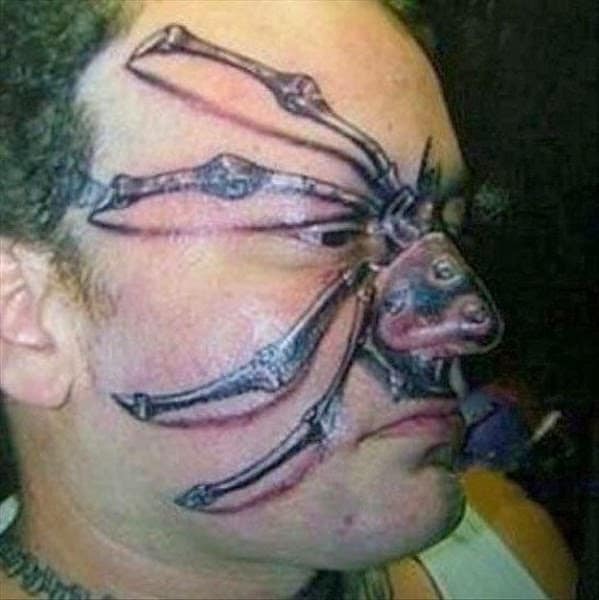 Some people get tattoos in places that are hidden, some get them in more visible areas, while some get giant spiders tattooed across the center of their face. Obviously this man wanted to get something that would make people remember him, maybe just developing an engaging personality would of been better. Doesn’t get on well with arachnophobes. 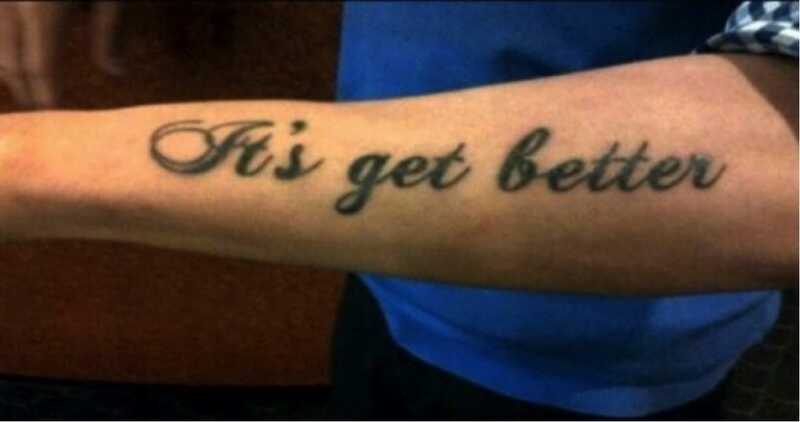 It’s remarkable that the tattooist was grammatical enough to include an apostrophe in the correct place, yet never questioned the gibberish nature of the whole tattoo. If the sentiment is referring to the person’s life, then I imagine after this tattoo it’s probably going to start get(ting) worse. You know what would make a great tattoo? A convicted child abuser. Tattoos of musicians have been around for years. What is questionable is getting the mug shot of a former lead singer tattooed onto your body. His crime? Child abuse. 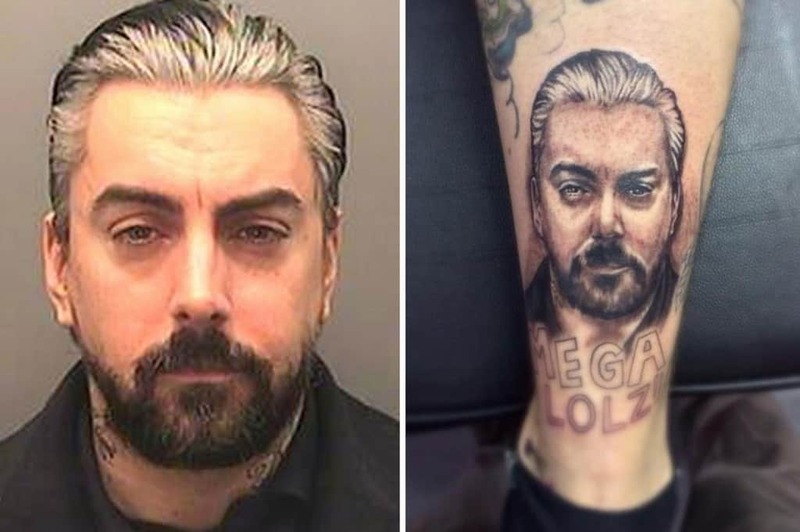 Former Lost Prophets frontman Ian Watkins is now serving 29 years in prison for his heinous crimes, making this one of the worst ideas for a tattoo ever. Why someone got this tattoo will be a hard one to explain to people, other than the obvious reason of “I’m an attention seeking moron”. If some people get tattoos for the sole purpose that others inquire about them, then this monstrosity does the job perfectly. The main question being “What the hell is that supposed to be?” Is it Roger from American Dad cut in half? A really bad E.T.? 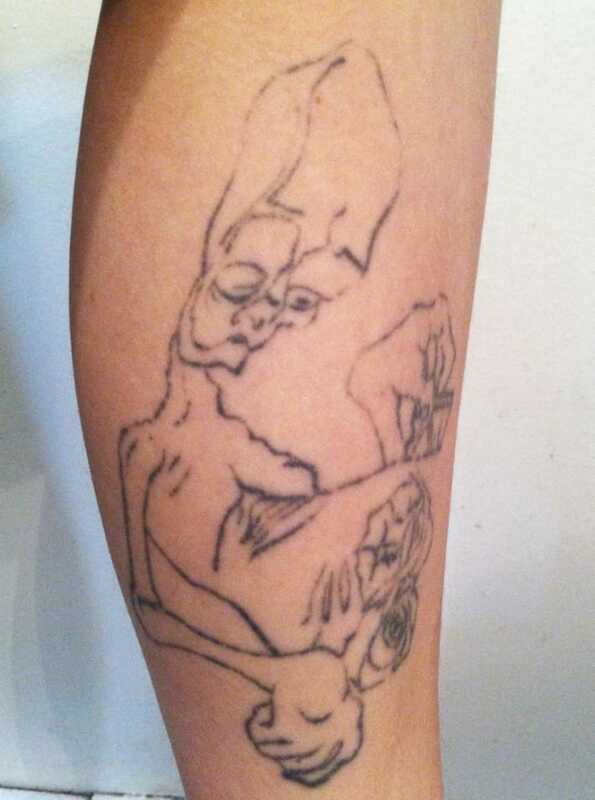 This manages to be both terribly drawn AND a bad idea for a tattoo – well done. In what one would imagine is an attempt to capture the moment of marriage between two people, this piece ended up looking like something from a Rob Zombie horror. 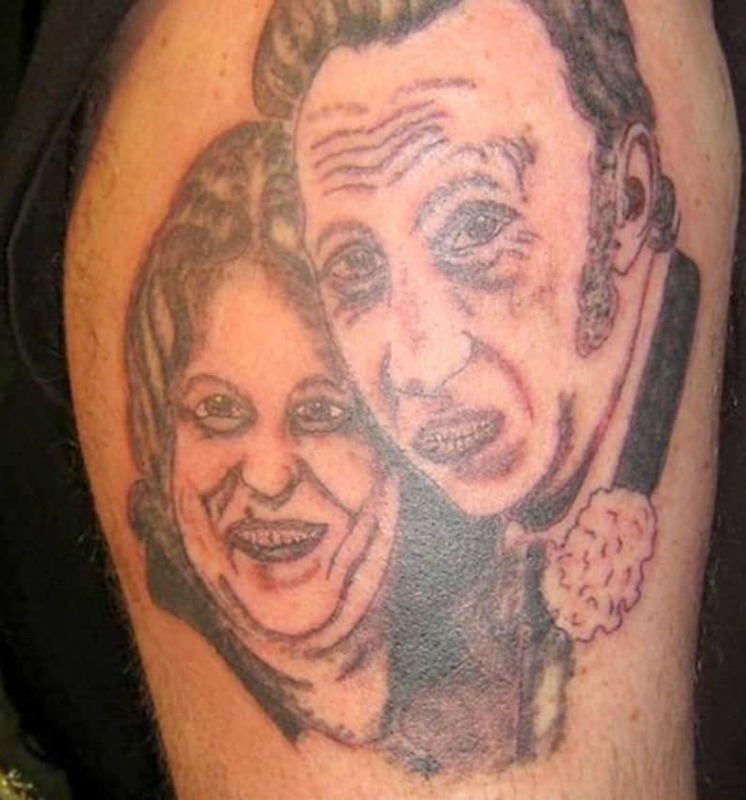 The couple appear to resemble ghouls that have returned from the dead, while this is definitely one tattooist who needs to work on drawing faces – especially mouths. Another common tattoo is getting a partners named inked upon your body. What isn’t so common is having a partners name plastered in GIANT LETTERS right across both sides of your face. Here’s hoping they never get a divorce, otherwise there’s going to be some expensive and painful tattoo removal surgery for her. A pity the guy’s name wasn’t Bob, that would of made things easier. 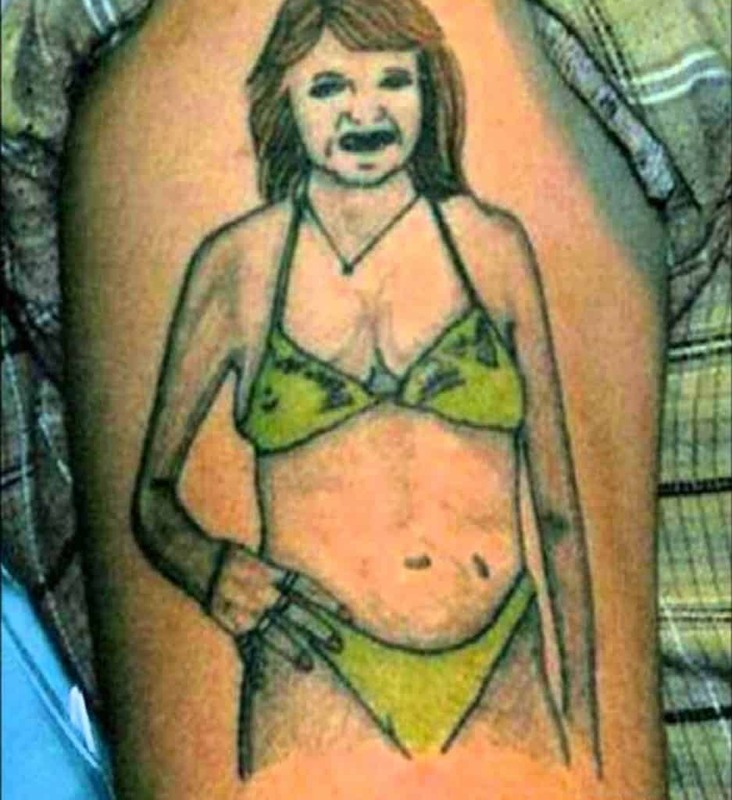 Managing to be both terribly drawn and massively unflattering, this really is one of the worst tattoos ever. Resembling something a child would draw, almost every part of this is piece wrong. 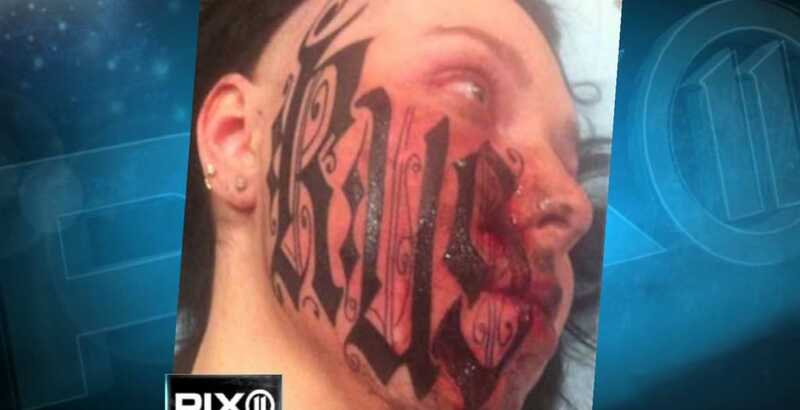 Hopefully this wasn’t a tribute to someone’s girlfriend, otherwise she’ll of likely left him, leaving a constant reminder to never go to a cheap tattooist.